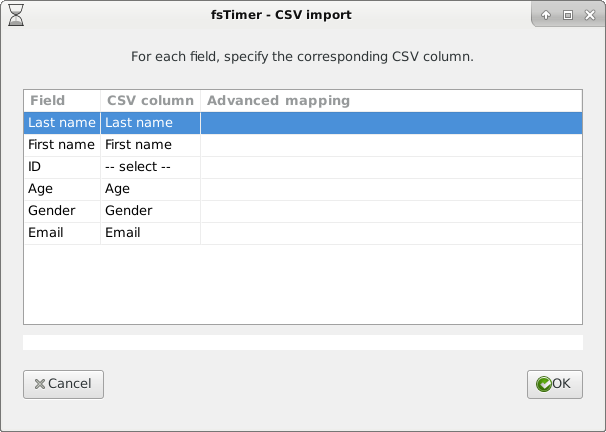 The import module allows for a csv file to be imported into an fsTimer registration database. 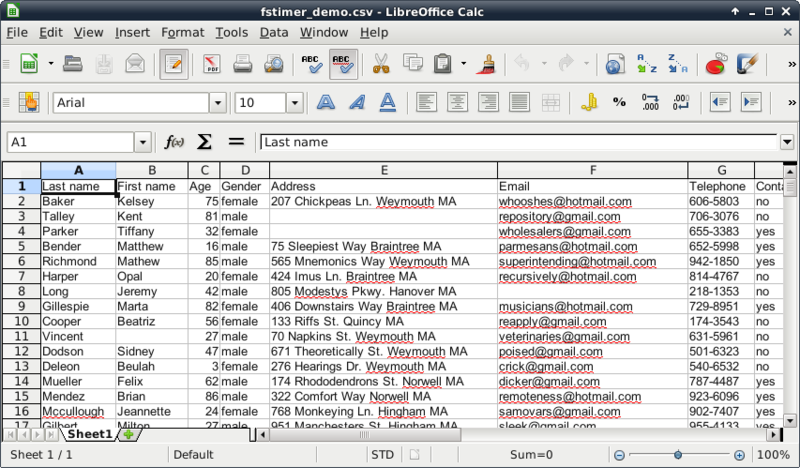 Starting from an Excel or Libreoffice spreadsheet, you can do "Save as" to save it as a csv file. 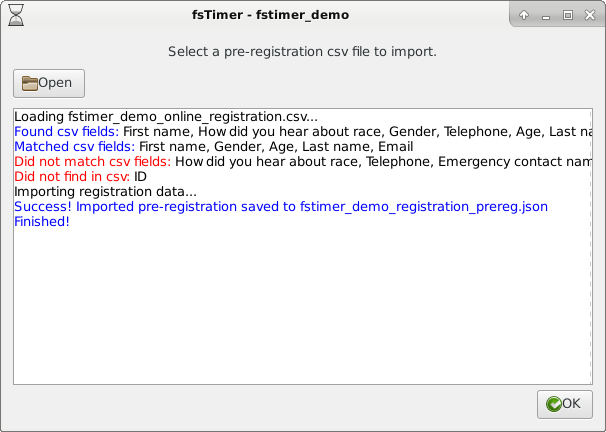 See the fstimer_demo_online_registration.csv file that comes in the fstimer_demo project preloaded in fsTimer for an example of how the spreadsheet should be formatted. The first row is a header row, giving the name of each column. For each registration field (left column), you must specify which CSV column contains data for that field (middle column). CSV fields with names that exactly match registration fields are automatically matched, but can be re-assigned. Clicking on an entry in the middle column will bring up a drop-down list of all of the CSV fields present in the file. If you do not wish to map any of the csv fields to a particular registration field (for instance, maybe you do not have IDs in your csv file) then click on the drop-down menu and select "-- Leave Empty --". "Found csv fields" lists all of the columns found in the csv file (these will be exactly all of the column headers). "Matched csv fields" lists all of the columns from the csv file that were automatically matched with the registration database fields by having identical names. "Did not match csv fields" lists the columns from the csv file that did not have exact matches in the registration database. "Did not find in csv" lists the registration fields that were not automtically matched with CSV columns - these fields were either manually assigned or specified to be left blank. In this case, "ID" is a registration field but was not in the csv (that will be the case if you assign bib IDs when runners pick up their bibs, as we do). 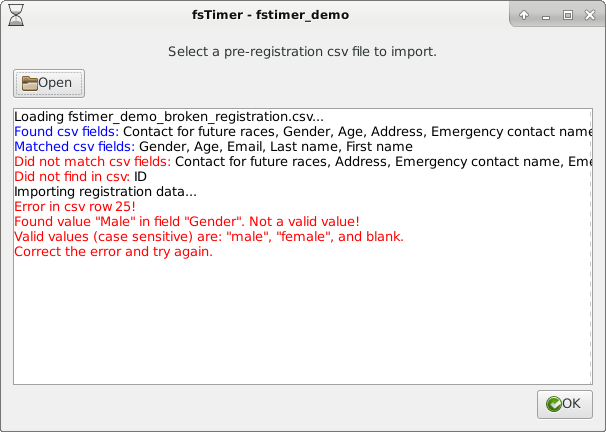 The error tells you what the invalid value is ("Male" instead of "male", "female", or blank), and where in the csv the error is (row 25). Correct any errors until the csv imports directly. When the csv is successfully imported, it will write the corresponding registration database file to a file named project_name_registration_prereg.json, in the directory fstimer/project_name. The file name is printed in the text field on the pre-registration window. Note that if a file project_name_registration_prereg.json already exists (for instance, because you already imported another csv in this same project), it will be overwritten. Continue on to Section 4.3 Registration - details.